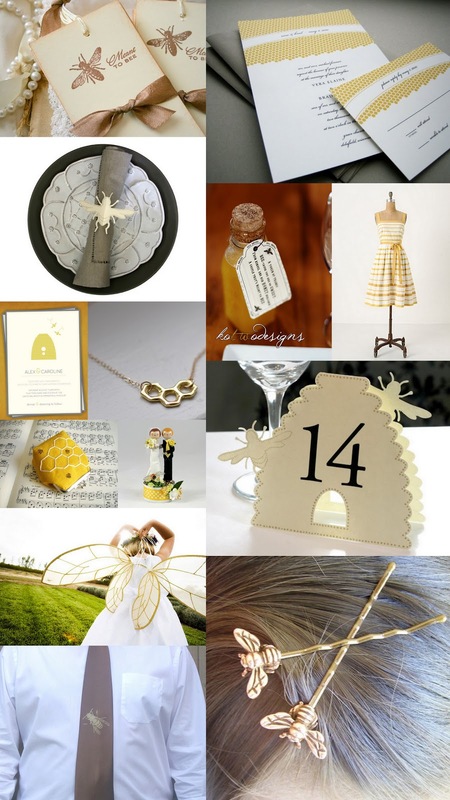 Here's a quirky little inspiration board for you based on one of nature's most misunderstood creatures, the honey bee. Bees are industrious, work together in harmonious unison, and if we look back to ancient times in Egypt, the symbol of the bee was used to represent royalty. In terms of colors, black and yellow are always what come to mind when we think of these insects. But, your event or decor can certainly be the bees knees without totally going overboard with the color, just stick with a more saturated hue like a mustard or golden honey and stay away from the bright crayon kind of yellow you might be used to. Decorate with gold and black accents, add honey comb patterns to your stationary or decor, give away natural local honey, and whip you hair into a high and mighty beehive and you'll have an event that is truly buzz-worthy.